It's hard to stay active in the winter. When days get short and the temperature begins to plummet, most of us just want to lay on the couch or curl up in front of the fire. But that doesn't work very well if you want to lose weight. Of course, you can use diet alone to slim down, but the best way to lose weight is to combine diet and exercise. So how do you burn more calories when it's cold outside? I went to Glennis Coursey, the Lead Coach at MyFitnessPal to get some ideas for fun winter workouts. MyFitnessPal is an online resource for dieters and other folks who like to stay active. Their mobile app and website can help you track calories and daily activity to slim down and maintain good health. Of course,​ the number of calories that you burn when you try these sports will vary based on your size and the intensity of your activity, but any of these workouts will help you burn fat. If your outdoor chores have taken over your schedule, don't worry. Winter jobs burn mega calories, too. When you clear the driveway or clean the walkway, you can count that effort as a workout. Shoveling snow can burn 500 calories per hour, according to Glennis. And if you need to clean off your car before heading to work, she says that scraping ice off your car can burn another 250 calories per hour. Parenting duties can also turn into a workout in the winter. Glennis says that when you do family activities outside, you have more opportunities to burn calories. "When you haul the kids up a hill on a sled, build a snowman or go ice skating—all these things burn calories and are fun for the whole family." To stay safe when you exercise outside, Glennis recommends that you plan ahead. "Check the weather and look out for extreme conditions, low temps, snow or rain, high winds. That way you don't get caught off guard. I always try to schedule workouts as close to midday as I can to avoid the extra low temperatures in the morning and evenings and take advantage of the daylight." She also says that you should dress carefully, especially if you are doing high-intensity workouts that cause your body temperature to rise. "Dress in layers so you can take off items as you heat up. More importantly, you can put layers back on when you're sweaty to keep your body temperature from dropping too fast after a workout." Keeping your feet dry and warm is essential as well. 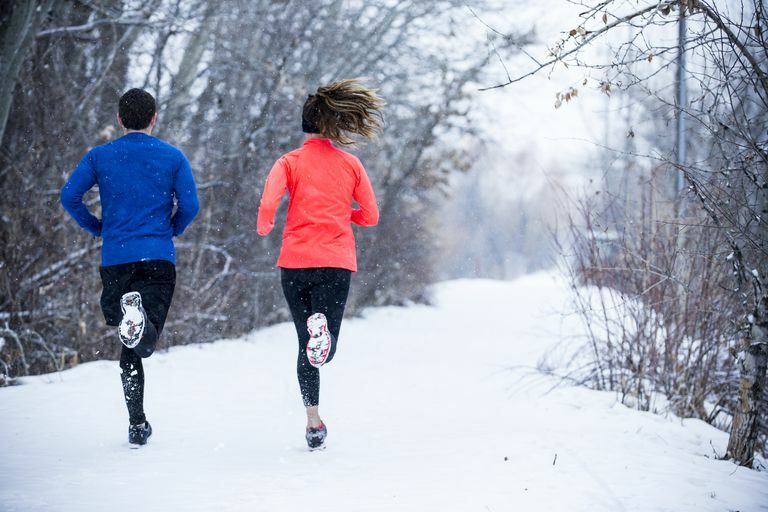 You'll be able to burn more calories in the snow if your feet stay protected. Wear warm waterproof shoes for activities like sledding or snowshoeing. Companies like BEARPAW make warm waterproof boots with strong rubber outsoles for good traction during activities in the snow. If you have boots that aren't completely waterproof, you can add gaiters to keep your feet dry. If you're doing a lower intensity workout, you should also be cautious. "It's especially important that you cover your head, toes, and fingers," she says. "Finally, recognize the signs of hypothermia and frostbite, and when you can, work out with a buddy so he/she can look out for signs, including shivering or nausea." And lastly, visibility is a big issue in the winter. Days get shorter in the colder months so it is likely that if you exercise outdoors that you will work out in dark early morning hours or dark evening hours. So it's important to wear technical apparel that is also reflective. Several brands make gear with high-tech visibility features. The Zap Collection by Sugoi, for example, is designed for high visibility when struck by artificial light. So if you are running or cycling near a road, drivers can see you and slow down for your safety. You'll find reflective gear for a wide range of sports and for every part of your body, including jackets, pants, gloves and even shoe, helmet and pack covers. Of course, there will be times when the weather conditions prevent you from enjoying an outdoor workout. If that's the case, get creative to burn more calories inside. Clean your house. Believe it or not, you can turn your housecleaning chores into a total body workout. Simple strength workout. Winter is a great time to start a strength training program at home. You won't need any special equipment if you do workouts that include body weight exercises. Use DVDs and online workouts. You don't need to brave snowy road conditions if you do an online workout in your home. Many websites offer free classes that you can stream at your convenience.